Jacek Rykała graduated from the Academy of Fine Arts in Kraków, the Department of Graphic Arts, in 1976. 2009 Tableau… mowa wygnana” (together with A. Tobise and I. Walczak), Kameralna Słupsk Gallery, Baltic Modern Art Gallery. 2010 Chily Mornings, Krypta u Pijarów Gallery, Kraków. December 2005: Performance of the play A House to Demolish at the National Museum in Kraków, Main Building. The play was accompanied by a presentation of Jacek Rykała’s paintings. 7 February 2005: A premiere of Jacek Rykała’s play Creamery directed by Rykała and performed on the stage in Malarnia at the Stanisław Wyspiański Theatre of Silesia in Katowice. 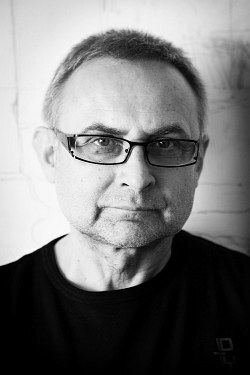 2 February 2012 ; A premiere of Jacek Rykala’s play Chily Mornings directed by Rykala and performed on the stage at the Zaglebia Theatre in Sosnowiec.